Foreword. Acknowledgements. Units of measurement. 1. General Introduction. 2. Steel Wire Ropes. 3. Wire Rope Haulage Systems. 4. Belt Conveying Systems. 5. Miscellaneous Conveyors. 6. Underground Locomotives. 7. Free Steered Vehicles. 8. Winding Engines. 9. In and About the Shaft. 10. In-Pipe Transport. 11. Aerial Ropeways. 12. Surface Mining Transport. Appendices. 1. Fluid Couplings. 2. Electro-Hydraulic Actuators. 3. Fatigue Life and Modifying Factors. 4. Tension in a Belt or Rope Passing Round a Pulley. 5. Mineral Characteristics. 6. Friction Wheel Winder Drum and Inertias. 7. Motor Rotor Inertias. 8. Head Sheave and Deflector Sheave Inertias. 9. Winder Reduction Gear Inertia. 10. Rope Adjustment of By-Cylindor-Conical Drums. Author index. Subject Index. 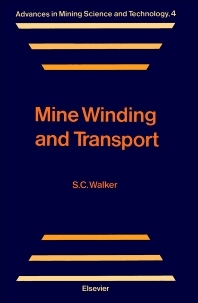 Changes in size and power of available mining transport equipment, combined with improved means of control involving leaky feeder radio and computers, demands a new look at the problem of mine winding and transport. Such changes require the traditional mining engineer to have a much greater engineering application. This book is intended to satisfy that requirement. All the important means of transporting operatives and minerals are addressed, both below ground and on the surface. Safe, speedy and economic transport from the point of mineral extraction to leaving the mine is paramount. This work covers all aspects of the problem including: (1) the design and application of steel wire ropes to a variety of industrial applications, and the various drums and pulleys necessary; (2) a ready means of calculating output/throughput of various transport modes, and relating such to their power requirement; and (3) information on transport modes that enables the most suitable system for given conditions to be determined. A first principle'' approach has been adopted throughout, and extensive use of practical examples allows the solution of virtually all associated problems. Although formulae are used where necessary for an understanding of the content, the numerous tables included enable the practicing engineer to make short cuts to more quickly solve particular problems. In addition, the provision of a considerable number of operational constants, many not previously published, enable a more speedy and accurate solution to be effected. By comparing the calculated solutions to a particular problem, the most economic transport mode may be determined. Mining, mechanical and electrical engineers concerned with the safe movement of men or material will find this book of particular use, as will the student preparing for examinations on the subject.